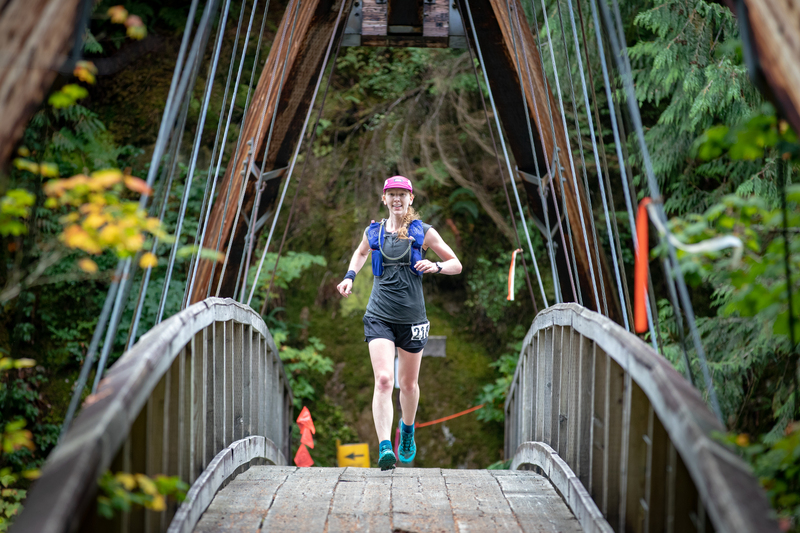 The start is at the Middle Fork Trailhead, and the courses take runners on the Middle Fork Trail and CCC Trail, the longer courses venturing farther up the valley to the Dingford Creek bridge, Goldmyer Hot Springs, and toward Dutch Miller Gap, then back. All courses have modest climb, since the routes follow the river, with a few meanders of the trail up and down the valley slope. 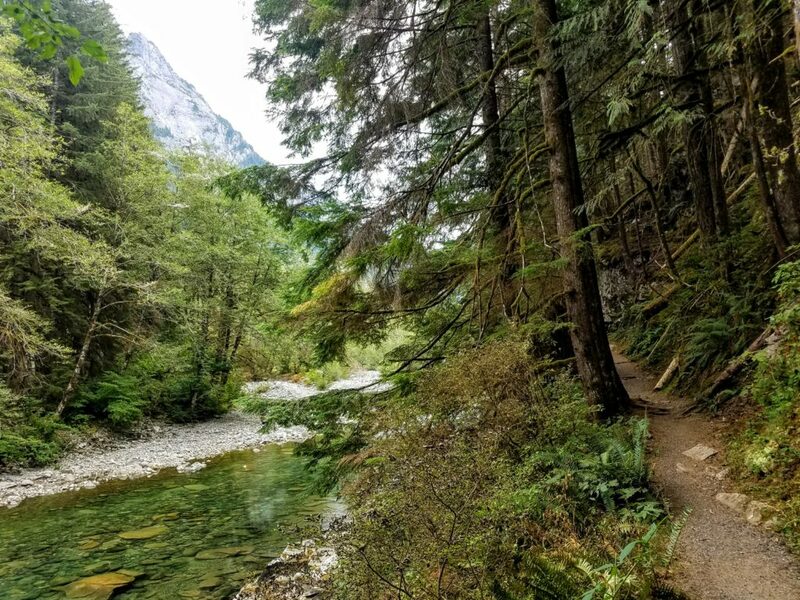 The valley features views of the rugged mountain slopes, old-growth trees, majestic cliffs, lush forest, the swiftly-flowing Middle Fork Snoqualmie River, and perhaps some birds fishing along the river. 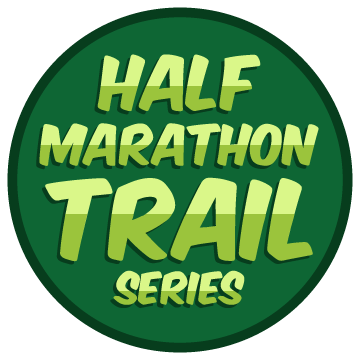 Detailed route descriptions can be found in the Course Description section, and an updated route map will be posted soon. Online pre-registration closes Thursday, September 5th at 11:59pm. 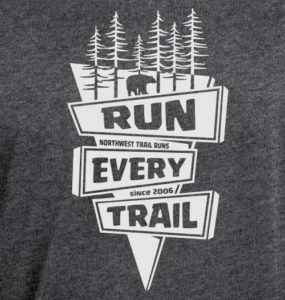 Runners in elementary, middle, or high school are eligible to receive a $10 discount on online pre-registration prices . The discount will be auto generated based on your birthday. From the CCC connector trail, turn left at the junction just West of the campground, and onto the CCC trail for about 3 miles West to Aid Station 1 where the trail meets Middle Fork Road. 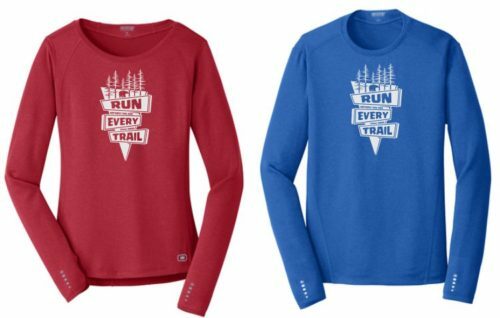 Go 2.8 miles to where the trail meets Bessemer Road (a gravel forest road), turn left/straight onto the road, and go another one-third of a mile to Aid Station 2 at a sharp left turn in the road. From the aid station, turn right/straight onto the continuation of the CCC Trail, and follow it past the 22-mile turn-around sign to where it meets a forest road again (about 2.8 miles from the aid station), and continue straight/left onto the road. Follow the road about 2.5 miles, first flat, then down a hill, to Aid Station 3 and the turn-around point, just before a blue gate across the road. Return from the way you came along the CCC Trail to the Middle Fork trailhead and Aid Station 4. 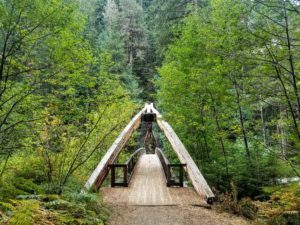 Go through the parking lot to Middle Fork Road, then along the road, past the campground entrance, across a bridge, past a road junction, and across another bridge onto the Snoqualmie Lake Trail (about 1.2 miles from the trailhead). Go about another 1.6 miles, 600m past the Half Marathon and 22-mile turn-around signs to a signed 50k turn-around point. Cross the river on the footbridge and turn left onto the Middle Fork Trail. Go about 0.75 miles to a signed turn-around point. Return the way you came on the Middle Fork Trail and across the bridge to finish at Middle Fork trailhead. From the aid station, turn right/straight onto the continuation of the CCC Trail, and follow it about 1.2 miles to the 22-mile turn-around sign. Return from the way you came along the CCC Trail to the Middle Fork trailhead and aid station. 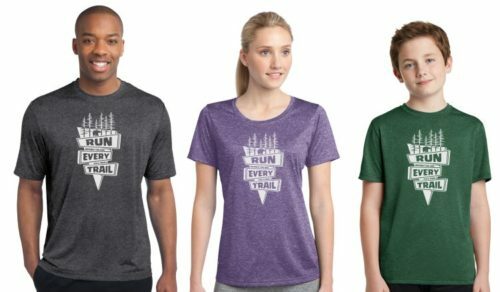 Go about another 1.2 miles to a signed Half Marathon and 22-mile turn-around point. From the CCC connector trail, turn left at the junction just West of the campground, and onto the CCC Trail. Where the CCC Trail meets the Middle Fork Road, there will be an aid station and turn-around point. From Aid Station 1, return along the CCC Trail and CCC connector to the road crossing, and finish at the Middle Fork Trailhead. * Distances were measured using a measuring wheel and a calibrated bike odometer, and elevation data were measured using a Suunto Ambit sport watch, available at The Balanced Athlete, your Suunto headquarters, located at The Landing in Renton. The distance is most likely within 1% of actual, and the climb within 5%. A pre-start briefing will take place 5-10 minutes before each start time. 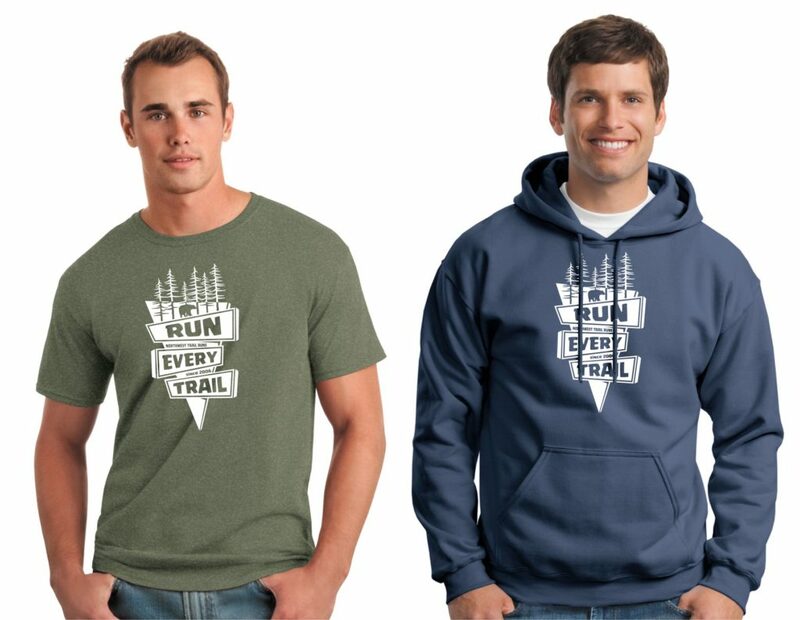 Here is a link you can use for directions to the trailhead. A NORTHWEST FOREST PASS IS REQUIRED to park at Middle Fork trailhead. An annual pass costs $30 and is honored at any Forest Service operated recreation area where a use fee is required. Note that this is different than a Discover Pass, which allows access to Washington State (not U.S. National Forest) lands. You can view options for purchasing a Northwest Forest Pass online or in-person at the Northwest Forest Pass website.